Losing your notebook is unthinkable. 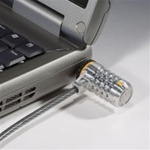 Protect your computer with incomparable security, the disc lock. The most advanced disc locking technology is featured with carbon tempered steel core cable, external braided steel sheath, and patented T-bar locking mechanism that attaches to the standard Kensington security slot found in 99% of notebook and computer devices. From Kensington, the world leader in notebook security. 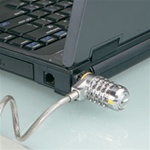 Protect your notebook and monitor with this double lock-head security system. 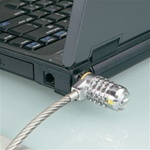 Patented T-bar locking mechanism and super-strong carbon tempered steel cable provide maximum protection that attaches to the standard Kensington security slot found in 99% of notebook and many computer devices. Lock down your computer system and leave it safe. Specifically designed for the mobile professional, MicroSaver Retractable combines premium notebook security with an easy-to-use design. A patented T-bar lock helps to safely secure your notebook, while the slim yet strong cable fits neatly into a compact, easy-to-carry case. 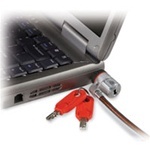 Retractable, portable notebook security cable. Patented T-bar lock ensures superior locking strength. 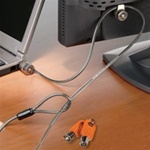 Strong and slim 4ft cable fits into compact, easy-to-carry case. 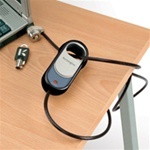 MicroSaver® Alarmed Computer Lock with audible alarm. 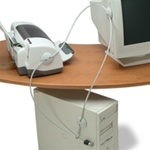 6-foot aircraft-grade steel cable attaches computer securely, and patented T-bar lock provides most secure locking. Fits into Kensington Security slot in computers and other devices. 1-year limited warranty and free technical support. Your computer carries your life. 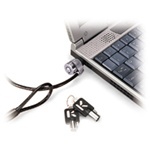 Protect it with this patented lock and cable system. Get the strongest theft deterrence with the ultimate combination notebook lock. Our easy-to-use combination lock with a new carbon tempered steel cable and patented T-Bar locking mechanism protects notebooks and other computer equipment from theft. Protect your notebook and the personal information you have stored from theft. Lock it with this easy-to-use, keyless 4-wheel combination lock from Kensington, the leader in notebook security. How much money did you put into building your computer system? You can protect that investment by locking together all your components and computer chassis. Why not get peace of mind today? How much money did you put into building your computer system? 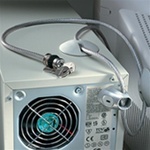 You can protect that investment by locking together all your components with one easy cable. Look for corporate custom-keyed solutions for your whole team.